Derek McGrath took the Gailltír camogie club for a guest session ahead of their All-Ireland final this weekend. Derek McGrath took the Gailltír club for a guest training session after they won the All-Ireland semi-final. THE GAILLTÍR CAMOGIE club are grateful for any advice they’re given ahead of their first-ever All-Ireland intermediate decider this weekend. They came close to reaching this point two years ago when they lost out to Tyrone side Eglish at the semi-final stage, but victory over St Rynagh’s last month allowed them to make the long-awaited breakthrough this year. It’s an exciting time for the Waterford club who celebrated their 60-year anniversary in 2018, and the groundswell of local support for their camogs is growing ahead of their trip to Croker on Sunday. They’ve been blessed with some help from outside the club too. 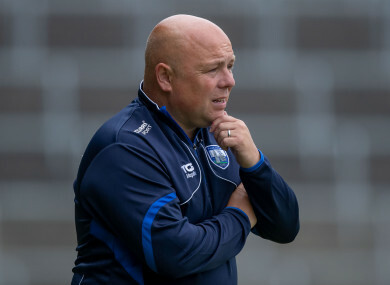 Former Waterford hurling manager Derek McGrath dropped by at one of their training sessions to impart some advice after that five-point semi-final victory. And with Down champions Clonduff awaiting to provide stiff opposition at GAA headquarters in the final, they’ll take all the help they can get. “He took a training session there, came along, helped us out and had a talk with us after,” says Gailltír corner-back Claire Dunne, who teaches alongside McGrath at the De La Salle college. “We’d take any advice from anyone, they have all the experience and this is our first time out so it’s just great to hear another voice. “Our managers have put an awful lot of effort in this year for us, and since they came on board three years ago, so another voice is nice to have as well. He’s been here, he’s done it, he’s had the ups and the downs so it’s nice to hear another voice. Dunne isn’t long at the Waterford school where she teaches geography and history, but McGrath has already become a familiar face to her. Seeing him everyday at work didn’t lessen the impact of his presence when he took that training session with Gailltír, but she could see how his words resonated a bit more with some of her younger teammates. “Everyone really did [enjoy it], especially the young girls, I’m used to him. The Camogie rulebook has come under the microscope in recent times, with several inter-county players expressing their frustrations about the lack of physicality in the game. Dunne has found officials at club level to be more open to allowing physical exchanges happen in their games, although she would like to see the introduction of the shoulder challenge as well. A motion to bring in that kind of tackle was submitted to Camogie Congress last year, but was overwhelmingly rejected, with 93% of delegates voting against it. “I think there’s definitely more physicality in the game and I think referees have opened up to it to an extent. I’m pretty happy with it at the moment, the way things have gone. I definitely think with this whole idea of a tackle with the shoulder… People are much stronger, you’re able to take the hits. Gailltír have been closing in on a place in an All-Ireland decider for the last few seasons, but like many other clubs, they have had to suffer through the barren years too. Dunne refers to that time as the “slug period” in the club where some of their key players elected to go travelling for a time, but have since returned to bring a wealth of experience to the ranks. Dunne also points to an injection of youth in the team three years ago, when a batch of talented U16 and minor players arrived to further revitalise the squad. The blending of those two groups has yielded a first-ever Munster intermediate crown for the club in 2017 followed by a second one this season, and now a battle with Clonduff is all that separates them from All-Ireland glory. “The nerves are definitely there but it’s good nerves,” says Dunne. “I think with nerves, you’ll have them on the morning, you’ll have them before you go out but I think the beauty about camogie, hurling, any GAA sport, it’s not you individually, it’s a whole team so it calms your nerves. “Everyone is going to be feeling nervous but once you’re out there and you’re out there together, I’m sure we’re all playing for each other. Email “'Lovely fella, so down to earth' - Ex-Waterford boss gives coaching masterclass before All-Ireland final”. Feedback on “'Lovely fella, so down to earth' - Ex-Waterford boss gives coaching masterclass before All-Ireland final”.